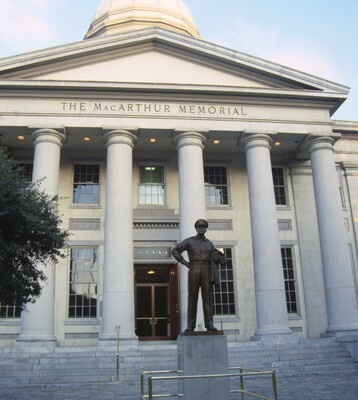 The MacArthur Memorial located in the old city hall at MacArthur Square in Norfolk. The 19th century city hall incorporates architectural elements from both the Greek and Roman revival. It was the site of the formal surrender to the Union Army in 1862. Smolski, Chet, "Norfolk: City Hall, MacArthur Memorial" (1990). Smolski Images. 625.